If someone suggested to me that it was a good idea to take a stroll along a freezing cold and damp clifftop path where only lichen grew, I think I'd pass... even before finding out that there were vampires in the vicinity. The lure is the vast wealth that the vampire in question has amassed, but of course in reality, he's just hungry. There's s quite extensive backstory to the vampire and how he came to be where he is. It makes for quite a good read, but the party will need to delve quite deeply into local history to find out much of it... unless the recruiters use some of it in their spiels. It does make the entire complex come to life, though, and there are further comments throughout the adventure text. The adventure proper starts with the party on that inhospitable clifftop track, standing in front of an iced-up door. Getting them there is, as ever, up to you. It would appear that despite the network of recruiters, nobody has actually entered here for many years, maybe even centuries (judging by the smell!). Once in, wall paintings can give some inkling of the history should the party stop to examine them. Onward, then, through various strange chambers with their complement of hostile flora and fauna, not to mention an array of traps magical and mechanical. It's a remarkably inhospitable place, and there's clear evidence of the deliberate thought process behind making it so - everything follows logically in sequence and it doesn't give the impression of a bunch of random traps and monsters but a carefully-considered challenge. And challenge it is, there's a lot that could easily prove deadly to unlucky or badly-prepared parties. One feature is a massive underwater combat where some vicious squid are the lest of the party's worries. There are plenty of other set pieces too, with challenges to both mind and body - illusions and the use of suggestion spells for example; and there is copious use of weaponised diseases. It's a nightmare of a place. The vampire himself is a powerful wizard who is credited with inventing an offshoot of necromancy that is even more disgusting - and he makes good use of his abilities as shown by the extensive discussion of his likely tactics once the party finally meet him. If they don't finish him off but escape, pure pride will cause him to hunt them down, and even if they do, most of the traps are still active when they attempt to get back out of the complex. It's a well-constructed and deadly adventure, those surviving will have reason to be proud of themselves. There's no scope for interaction, that isn't its purpose, but if you are seeking a purposeful challenge, a dungeon that has been carefully crafted to be deadly, this one fits the bill admirably. 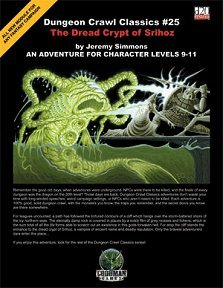 Return to The Dread Crypt of Srihoz page.